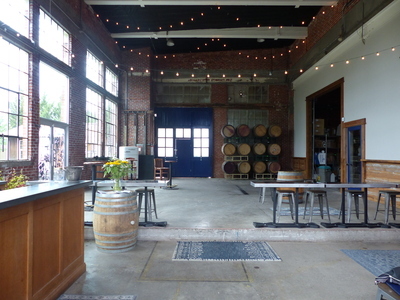 The interior of the tasting room and winery at Elizabeth Chambers Cellar in McMinnville, Oregon is photographed during an oral history interview with Liz Chambers on June 23, 2016. Chambers was interviewed by Linfield College Archives staff Rich Schmidt and student Stephanie Hofmann. Linfield College Archives, "Elizabeth Chambers Cellar Tasting Room 01" (2016). Browse All Willamette Valley Oral History Interview Photos. Image. Submission 137.